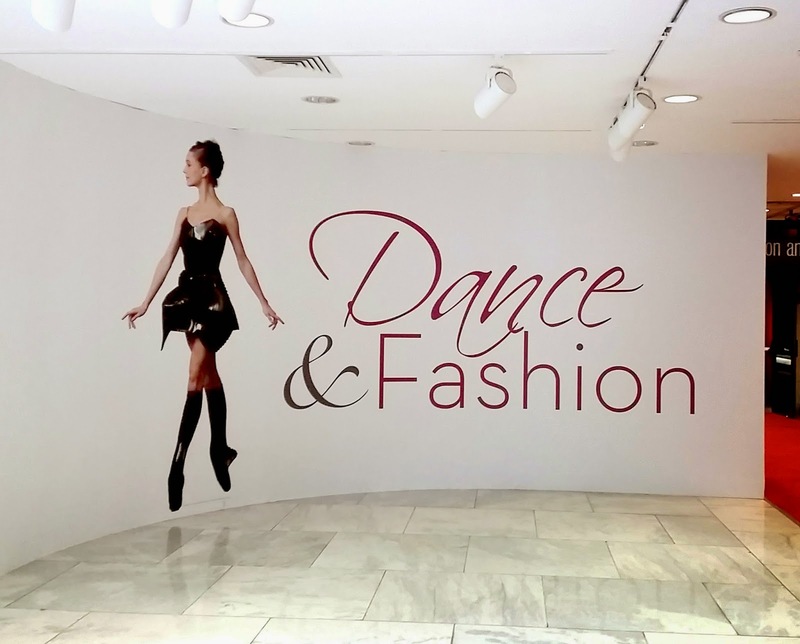 One of the things I was looking forward to seeing in New York was the current exhibit at the Museum at the Fashion Institute of Technology, titled "Dance and Fashion". The exhibit explores the connection between costumes worn in performance dance, and fashion designs, and the inspiration that flows between the two. In conjunction with the exhibit, the museum held a two day symposium that featured speakers from the dance and fashion world. If you require proof there are lots of fun and inexpensive things to do in New York, entrance to the symposium was free - you just had to register ahead of time. I had limited time so was only able to attend the Thursday morning session with the delightful Debra Rapoport. Yours truly and Debra, who was wearing another one of her amazing hats made from Viva paper towels. Three young women sitting behind us asked to take our photo so we got them to take one one with my camera as well. 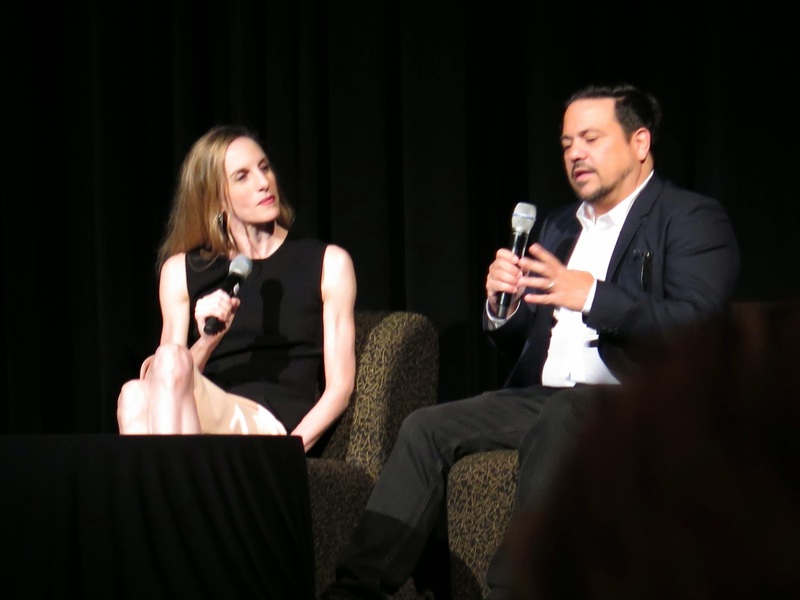 After an introduction by the museum's director, Dr. Valerie Steele, dancer Wendy Whelan and fashion designer Narciso Rodriguez took the stage. Whelan had recently retired from The New York City Ballet after 30 years with the company. Rodriguez has designed costumes for the New York City Ballet, and discussed the challenges faced in designing clothing to be worn by people who will be leaping, turning, and otherwise contorting their limbs into seemingly impossible positions. There was time for questions afterwards, and for some unknown reason, many people were quite interested to know if any serious costume malfunctions had happened on stage. 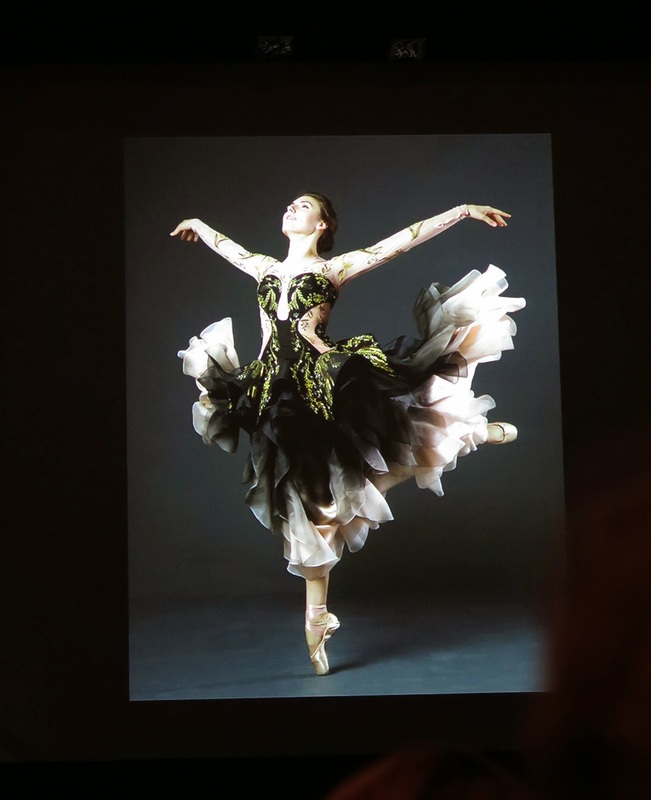 Marc Happel, director of costumes at the New York City Ballet, spoke about the various designers who have worked with the company including award-winning costume designer, Barbara Karinska. Karinska designed the costume worn by the female dancer in the photo on the screen. The costume above was designed by Sarah Burton, currently the Creative Director of the brand Alexander McQueen. After the morning session, Debra and I had lunch with the three lovely young women who were sitting behind us during the session. From left to right: Michelle, Nina and Caroline. Michelle and Caroline are in their first year of a two year master's program at Parsons, and Nina was visiting from England. 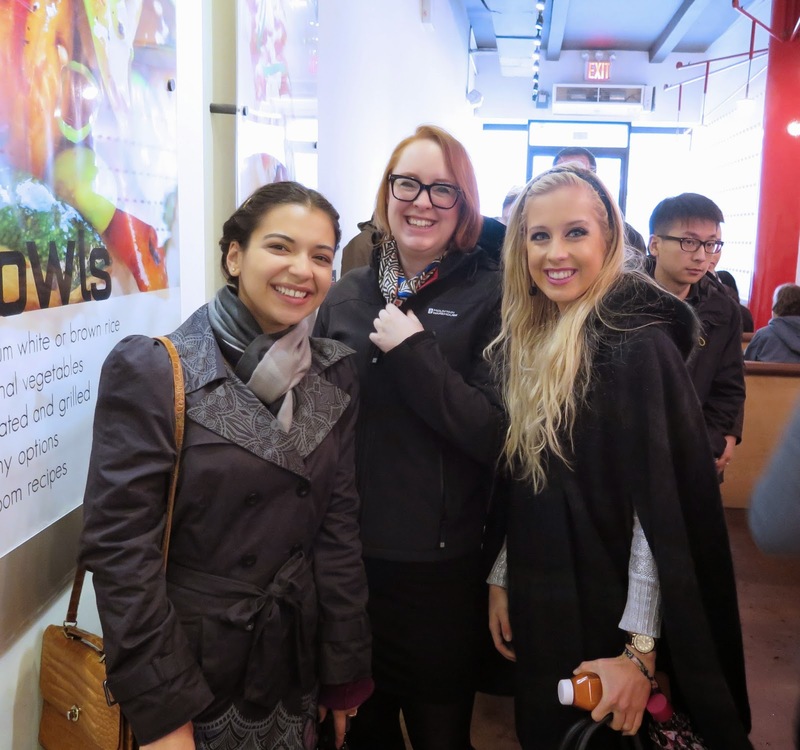 They were wonderful lunch companions and amazingly enough, I ran into Michelle and Caroline later in the weekend. 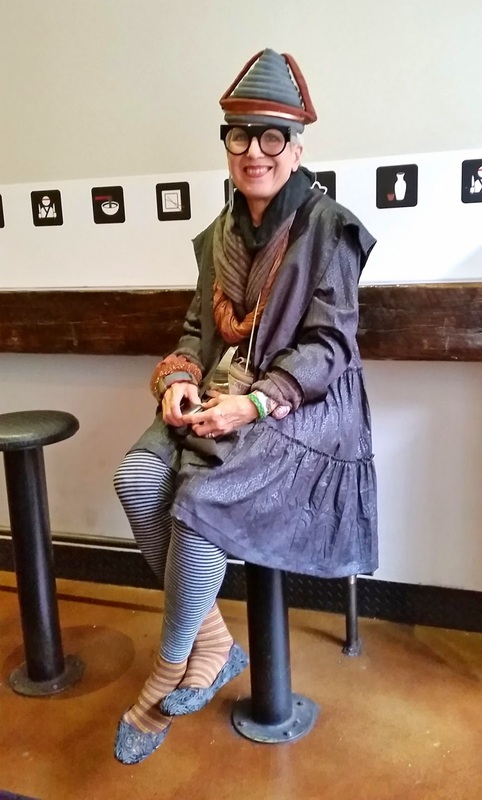 It was great to see Debra again, and marvel at the creativity she incorporates into every outfit; she made all of her accessories, including a funky necklace made from a metal cheese grater. I had yet to see the actual exhibit, so when Debra went back to the symposium, I headed to the Museum. 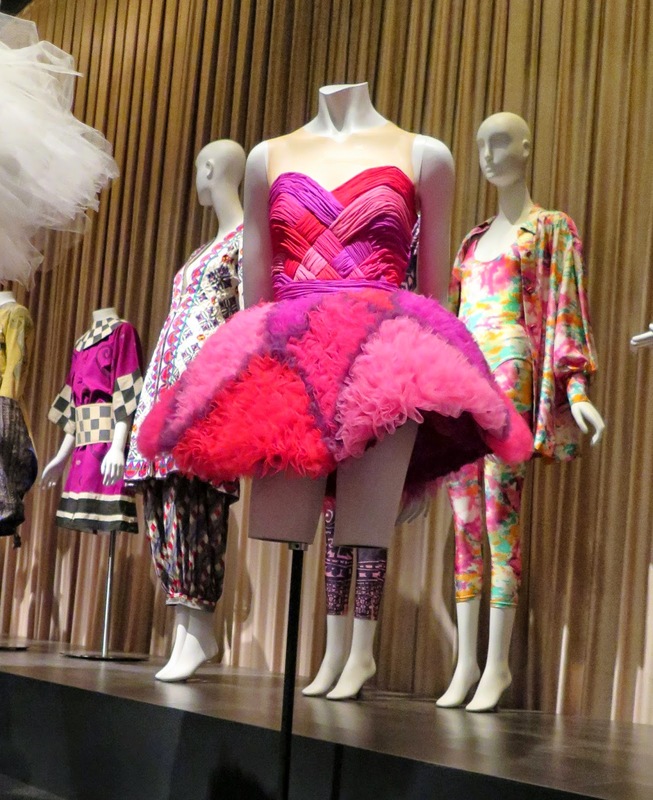 The exhibit, organized by Dr. Valerie Steele, features close to 100 dance costumes (some created by fashion designers), and fashion designs inspired by dance costumes, In many cases it is difficult to tell which is which. Traditionally, dance costumes were designed by the dancers themselves, by artists such as Leon Bakst and Christian Berard, who were hired by The Ballet Russes to design for a specific ballet, or by costume designers like Barbara Karinska. When a fashion designer takes on the job of creating costumes for ballet or modern dance they must remember they are designing for an athlete, and allow for freedom of movement, and any embellishment must be placed so as not to interfere with any lifts by a partner. 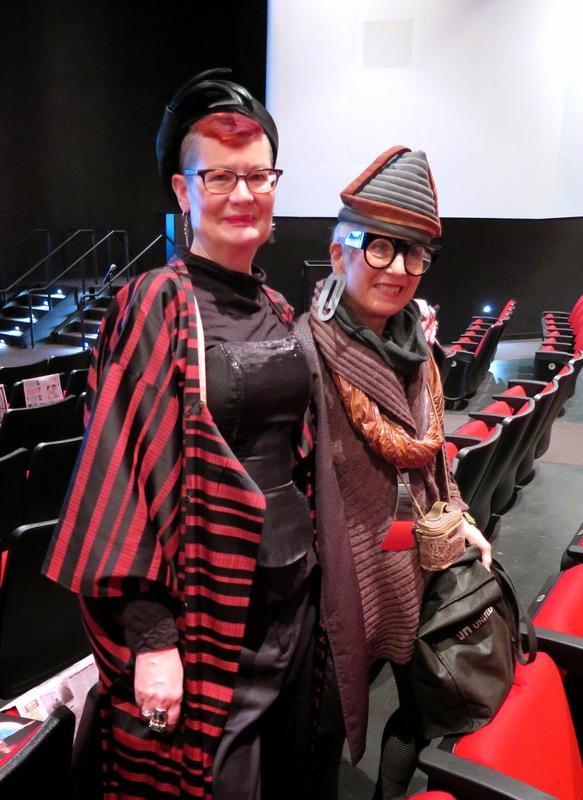 Some of the successful collaborations between designer and dance company have been Jean Paul Gaultier's costumes for dance performances choreographed by Regine Chopinot in the 80's and 90's, and Halston's costumes for Martha Graham. The exhibit is arranged in four sections, with the oldest ballet costumes grouped together. Above left is a costume designed for George Balanchine's "Cotillon" based on a 1932 Christian Berard design. The costume is paired with a Balenciaga dress with a skirt in a shape and fabric that echoes that of the the ballet costume. 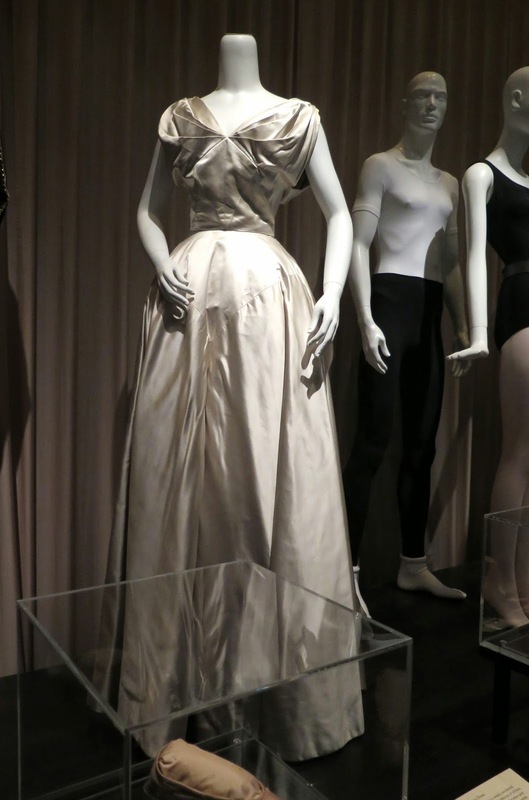 Christian Dior's "New Look" silhouette was inspired by the longer ballet skirts of that time period. 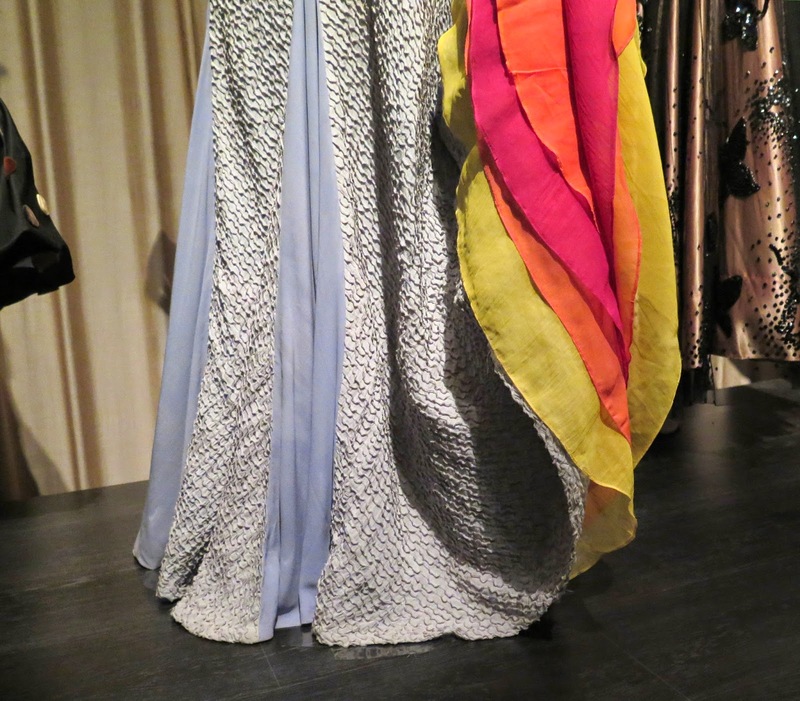 There was a display devoted to costumes on loan from the Martha Graham Dance Company, some of which were designed and worn by Graham herself, others a result of a collaboration between Graham and designers such as Calvin Klein, Halston and Donna Karan. The costume on the left was designed by Halston for a dance titled "Tangled Nights". Some dancers were very stylish dressers off the stage. The dress in the photo above belonged to ballerina Margot Fonteyn, and was designed by Hardy Ames. 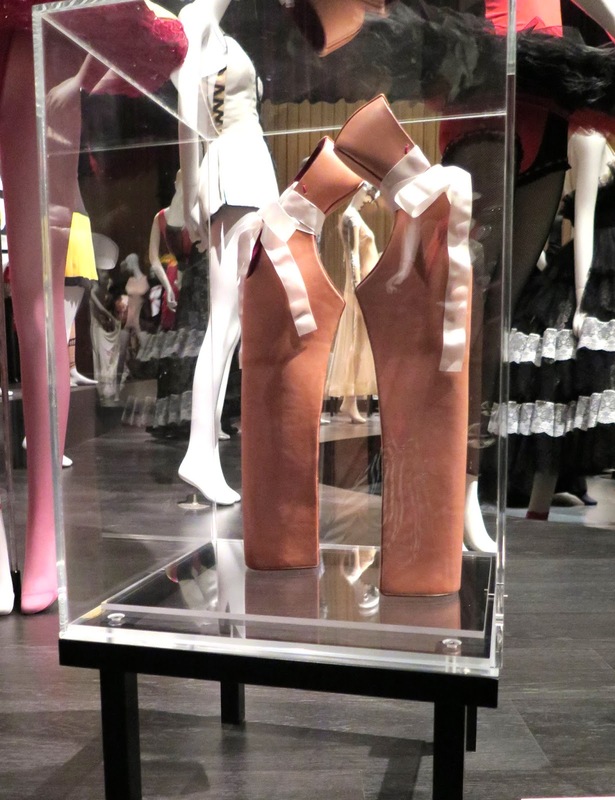 Ballet dancers' toe shoes have inspired a number of contemporary shoe designers; the pink and black shoes above were part of Rei Kawakubo's Biker Ballerina Collection from 2005. The tutu above was one of my favourite pieces in the exhibit, for the design and the colours. It was designed by Valentino for the New York City Ballet in 2012. 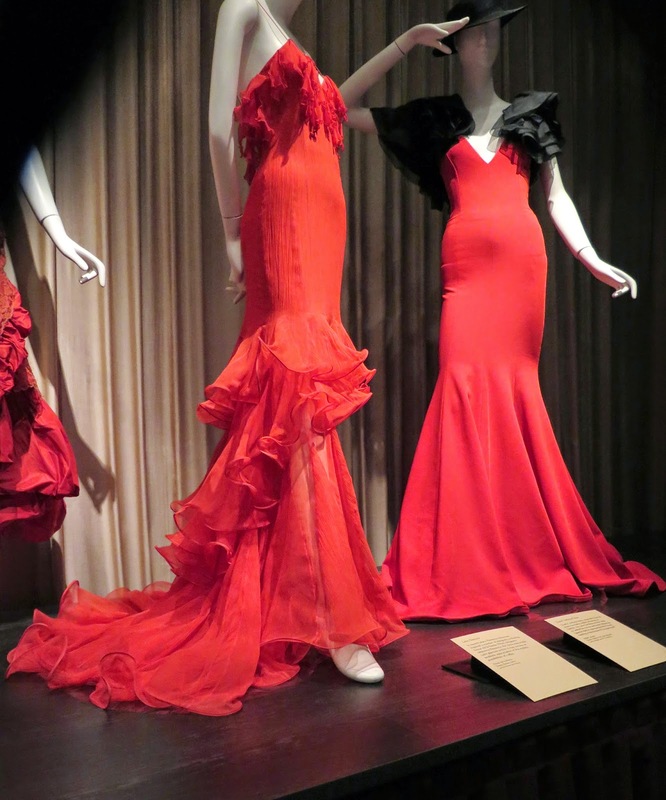 The dresses above were inspired by the ruffled dresses worn by Spanish Flamenco dancers. The one on the left was designed by the recently departed Oscar de la Renta, and the one on the right, by Ralph Lauren. A simple pale blue evening dress by Elsa Schiaparelli from the 1930's reveals a multi-layered and multi-coloured underskirt that was also inspired by the dresses worn by Spanish flamencas. Men's dance costumes were also represented in the exhibit. 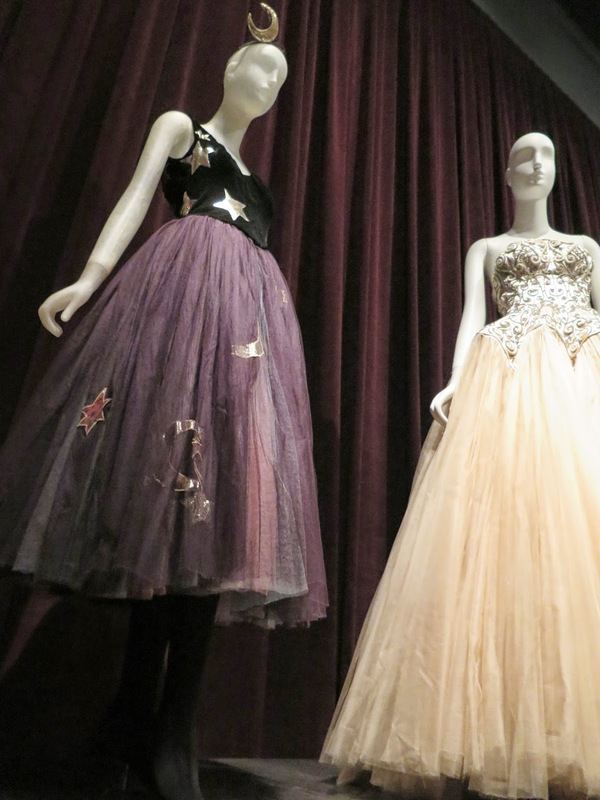 Left to right: Horsehair and organza skirt by Ralph Rucci, Stella McCartney's punk-inspired tattoo costume with spiked headpiece for Ocean's Kingdom (a ballet set to music by McCartney's father, Paul), bodysuit by Jean Paul Gaultier for "Facade, un divertissment", and a sheer costume with embroidery by Ricardo Tisci for Opera National de Paris. A costume from the New York City Ballet's 2013 production of Benjamin Millepied's Neverwhere, designed by Iris Van Herpen, is composed of hundreds of pieces of plastic. The dress, and matching boot/shoes, were featured in the poster for the exhibit (see first photo in this post) and it was very cool to see it up close. It would have been interesting to see this dress worn on stage, as I would imagine it would be noisy. 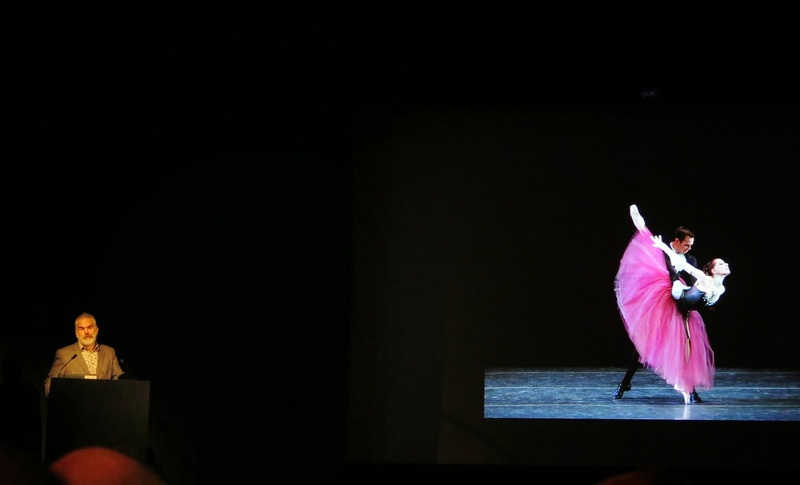 The dress does appear in a series of short (silent )videos of dance performances that is part of the exhibit. One of the introductions to the exhibit is photographer David Michalek's hypnotic, slow-motion video of wife Wendy Whelan, which was created for a Dries Van Noten retrospective. I stood in front of the screen for quite a while, mesmerized by the image of Ms. Whelan's slow spiral, dress billowing around her. As much as it was a special treat to see the details of the costumes, which would not be visible to a member of the audience from the stage, some of them cried out to be in motion and lost some of their magic when displayed on a mannequin. Still, the exhibit is a visual feast that should not be missed. What a cool post, Shelley. Looks like you had a fab time. How interesting to learn of the intersection of dance and fashion. A former dancer, I was immersed in the scene in my teens and 20s but had no idea how many fashion greats designed for dancers as iconic as Martha Graham. Thanks for sharing! Great post, Shelley. I went to the Exhibit and was enthralled by the costumes too. I tried to take a picture but got warned! Have a wonderful day. be still my heart. What a wonderful exhibit! fabulous event, and even more fabulous because you met Debra! !, and so interesting museum! Thanks so much for sharing this. Really looks like a wonderful interesting exhibit. What a wonderful exhibition, I would have really enjoyed seeing those fabulous costumes. 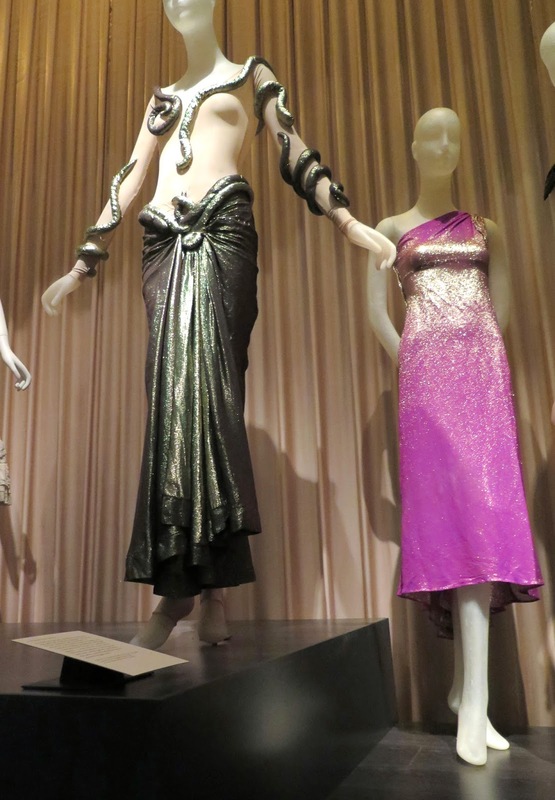 The Halston snake-y ensemble looks like something Theda Bara would have worn. Oh wow! Everything looks so awesome! I would have been too giddy to take decent photos! You look so in your element darling among all those fabulous costumes. I think you and Debra look so over the top stylish and original id have to take your picture and have breakfast with you too! I would really enjoy a few hours looking at all these fabulous creations. That pink tutu, don't even get me started I also loved that siler gray number with the snake parts up top. A wonderful post about a subject that is dear to my heart, spending years with Camille during her dancing era. The beauty that you portray in your photos is breathtaking. Looks like you and Debra had a great time; I admire her creativity and her zest for life! I've so enjoyed your fashion tours, Shelley. You're the best guide ever (and the best dressed for it too)! Thanks for letting me see what I otherwise would miss.